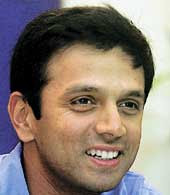 Rahul Dravid stepping down as Captain of Indian Cricket came as an absolute shock to me! Whatever his reason maybe, it leaves me sad and disappointed that someone, whose appointment as captain made me jubilant-ecstatic-giddy with happiness, is no more going to continue to provide me the thrills of watching him captain my country! i liked him as captain but kinda missed him as a batsman. so i guess its good for him and his fans. short term solution is Dada or jus go ahead with Dhoni. wat ya say..